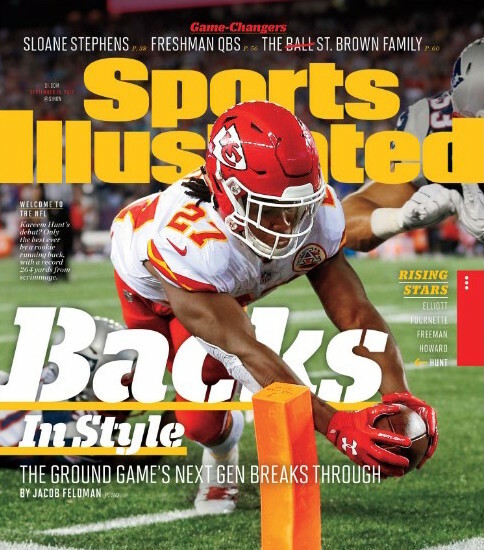 Former Toledo running back Kareem Hunt is on the cover of this week’s Sports Illustrated. Hunt gained 246 yards from the line of scrimmage, the most ever in an NFL debut, for the Kansas City Chiefs in their season-opening win over New England Sept. 7. He had 148 yards rushing, 98 yards receiving, and scored three touchdowns in KC’s 42-27 victory over the defending Super Bowl champs in Foxborough, Mass. He played for the Rockets from 2013 to 2016 and is the school’s all-time leading rusher with 4,945 yards. Check out the Sports Illustrated story here. This entry was posted on Thursday, September 14th, 2017 at 3:48 am and is filed under Athletics, News .